Getting personal: Martin Dlouhy, managing director, Metro Cash &amp; Carry, India. 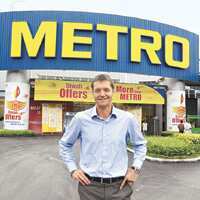 Getting personal: Martin Dlouhy, managing director, Metro Cash & Carry, India. I want to explain that we are a wholesale chain and sell only to registered customers. We are helping support mom-and-pop shops here. We give them products that help to run their businesses and compete with big retailers. We have customer consultants who help them build an assortment, and will bring one of our international programmes, where we create localized marketing campaigns for neighbourhood stores, to India next year. From your experience in international markets, what is the impact of organized retail on neighbourhood stores? How can small stores respond to such a threat? Yes, the coming of organized retail does lead to more competition and pressure for small shops. But, we believe individual shop owners can survive because they know their customers well. They can build their assortment, fine-tune it according to the needs of customers, and provide more personalized service. We have seen in Russia, central Europe and Turkey that the coming of organized retail led to initial surprise. But after that, small retailers can grow again. We saw the number of small retailers also increased. You are not allowed to sell agricultural produce in your Bangalore store. Now that the Agricultural Produce Marketing Committee (APMC) Act has been amended in Karnataka, is it possible for you to sell agricultural produce there? Would you like to? Of course we would like to. We have been waiting for this since many years. One of our main areas of competence is selling fruit and vegetables, and fish and meat. With the APMC Act being amended, we can show the full strength of our concept. We welcome the amendment, and are sure that farmers in the state will be greatly benefited from investments made by private companies such as Metro Cash & Carry. We will work in the agricultural supply chain along with farmers to reduce wastage which will help farmers get better valuation for their produce. By using cooled chain and selling the produce from temperature-controlled areas in our wholesale centres, we will be able to sustain quality levels and, thereby, help our business customers—especially the small darshinis (road-side eateries), to get better quality products at lower prices. Will you look at doing contract farming? We are looking at farmer support. In Hyderabad, where we can sell agricultural produce, we have a programme to integrate more with farmers. Our model includes more dialogue with farmers and more quality control, but there is also a choice about whether they want to sell to us or we want to buy from them. We are also studying other models. In India you have just opened three stores in three years. How come? Could you talk about your expansion plans? As a norm, upon market entry into any particular country Metro Cash & Carry takes time to understand local needs and business practices before it starts its local expansion. In countries where the supply chain is not organized—like, for example, in India—where the supply chain is fragmented and long, it takes us more time. In such?cases,?Metro?Cash & Carry has to work within the supply chain closely together with suppliers, producers and manufacturers to achieve efficiency before it enlarges its expansion. We are now ready for quick and rapid expansion across the country and are closely examining the market for expansion opportunities. The opening of your store in Kolkata has been delayed. Why is that? How much loss has that led to? There was a land dispute on our land (that did not relate to us) which led to a court order to stop work on the site. Work stopped in February and we are resuming now. The store will open in the second quarter of next year. While there is some confidentiality about the losses, I can tell you it runs in to tens of millions of rupees. Yours is a low margin business. What do rising rental costs mean to you and how are you getting around this? Our preference is to buy land; however, we also consider long-term lease (e.g. 99 years). Very important for us, in respect to real estate, is price or lease conditions—our business model is based on low margins and low costs, high real estate cost would drive our investments and render the overall business case not feasible. And this is still the major challenge for us in India. We have made some adjustments in our Bombay (Mumbai) store. For the first time, there is a two-level, underground parking and a two-level store. This debate is going on in many parts of the world right now. From our experience, I can only say that regulation hurts the market.